Ukulele Songs is the second solo studio album by American singer and Pearl Jam frontman Eddie Vedder. It was released on May 31, 2011. The album is composed of original songs and new arrangements of several standards. The cover art features a photograph of the sculptural work "The Lost Correspondent" by Jason deCaires Taylor. The sculpture is underwater with many others at a dive site called Moliniere Bay – Underwater Sculpture Park, Grenada. The album has been met with generally favorable reviews and currently has a 68% rating on Metacritic. Rolling Stone magazine gave the album three and a half star saying "The ukulele doesn't allow for the widest range of expression, which makes it a challenging foil for Eddie Vedder, who never met a feeling he couldn't drive through a wall. But this uke-suffused album stands up because he adapts the instrument to his idiosyncratic needs." Eddie Vedder did a solo tour through various parts of North America to promote the album, with support from Glen Hansard. Vedder stated that the shows would be performed in smaller venues than those used by Pearl Jam. He cites this as a relief, as he claims "It's hard to be subtle when the back row of the crowd is 200 yards away". The tour began on June 15, 2011 and finished on July 16 in Seattle. The tour received positive reviews from critics. In 2012 Vedder was scheduled to play shows across the Southern United States beginning in April. However, these dates were postponed until November, after Vedder suffered temporary nerve damage in his right arm after an earlier injury to his back. European shows started in July, which included his first solo shows in the United Kingdom. All tracks written by Eddie Vedder, except where noted. ↑ "New Eddie Vedder Record and DVD Coming May 31". pearljam.com. Retrieved March 21, 2011. ↑ "Eddie Vedder Solo Album 'Ukulele Songs' Due In May". billboard.com. Retrieved March 21, 2011. ↑ Poseur, Nameless (2011-04-25). "Eddie Vedder Reveals Ukulele Songs Album Art • News •". Exclaim.ca. Retrieved 2011-07-12. ↑ Mikael Wood (2011-05-25). "Ukulele Songs review – Eddie Vedder – Pearl Jam Review | Music Reviews and News". EW.com. Retrieved 2011-07-12. ↑ "Eddie Vedder 'Ukulele Songs': Track-by-Track Review". Billboard.com. 2009-09-14. Retrieved 2011-07-12. ↑ "Album review: Eddie Vedder's 'Ukulele Songs' – latimes.com". Latimesblogs.latimes.com. 2011-05-31. Retrieved 2011-07-12. ↑ "Album Reviews: Eddie Vedder: Ukulele Songs". Pitchfork. 2011-06-01. Retrieved 2011-07-12. ↑ Hyden, Steven (2011-07-05). "Eddie Vedder: Ukulele Songs | Music | Music Review". The A.V. Club. Retrieved 2011-07-12. ↑ "Eddie Vedder Performs New Tracks, Pearl Jam Deep Cuts at Solo Acoustic Show". Rolling Stone. Retrieved 2011-07-12. ↑ "Eddie Vedder Solo at Detroit's Fox Theatre Review – An Alternative Performance". lasplash.com. Retrieved 2011-07-12. 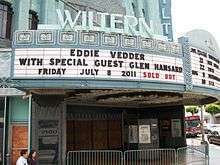 ↑ "Live review: Eddie Vedder at the Wiltern". LA Times. July 10, 2011. Retrieved 2011-07-12. ↑ "Pearl Jam frontman ventures across the south beginning April 11". billboard.com. Retrieved 2012-03-12. ↑ "Eddie Vedder Postpones US Solo Tour Dates". pearljam.com. Retrieved 2012-04-06. ↑ "Eddie Vedder announces first-ever UK solo shows". NME. Retrieved 2012-03-12. ↑ "Australiancharts.com – Eddie Vedder – Ukulele Songs". Hung Medien. Retrieved November 6, 2016. ↑ "Austriancharts.at – Eddie Vedder – Ukulele Songs" (in German). Hung Medien. Retrieved November 6, 2016. ↑ "Ultratop.be – Eddie Vedder – Ukulele Songs" (in Dutch). Hung Medien. Retrieved November 6, 2016. ↑ "Ultratop.be – Eddie Vedder – Ukulele Songs" (in French). Hung Medien. Retrieved November 6, 2016. ↑ "Danishcharts.com – Eddie Vedder – Ukulele Songs". Hung Medien. Retrieved November 6, 2016. ↑ "Dutchcharts.nl – Eddie Vedder – Ukulele Songs" (in Dutch). Hung Medien. Retrieved November 6, 2016. 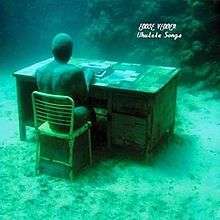 ↑ "Lescharts.com – Eddie Vedder – Ukulele Songs". Hung Medien. Retrieved November 6, 2016. ↑ "Offiziellecharts.de – Eddie Vedder – Ukulele Songs" (in German). GfK Entertainment Charts. Retrieved November 6, 2016. ↑ "Greekcharts.com – Eddie Vedder – Ukulele Songs". Hung Medien. Retrieved November 6, 2016. ↑ "Italiancharts.com – Eddie Vedder – Ukulele Songs". Hung Medien. Retrieved November 6, 2016. ↑ "Charts.org.nz – Eddie Vedder – Ukulele Songs". Hung Medien. Retrieved November 6, 2016. ↑ "Norwegiancharts.com – Eddie Vedder – Ukulele Songs". Hung Medien. Retrieved November 6, 2016. ↑ "Portuguesecharts.com – Eddie Vedder – Ukulele Songs". Hung Medien. Retrieved November 6, 2016. ↑ "Spanishcharts.com – Eddie Vedder – Ukulele Songs". Hung Medien. Retrieved November 6, 2016. ↑ "Swedishcharts.com – Eddie Vedder – Ukulele Songs". Hung Medien. Retrieved November 6, 2016. ↑ "Swisscharts.com – Eddie Vedder – Ukulele Songs". Hung Medien. Retrieved November 6, 2016. ↑ "Eddie Vedder | Artist | Official Charts". UK Albums Chart Retrieved November 6, 2016. ↑ "Eddie Vedder – Chart history" Billboard 200 for Eddie Vedder. Retrieved November 6, 2016.